While I can (as I did) still stretch the knitting flat and disk like—there have been almost a dozen rounds since the last (and for the hat crown) final increase, and it's now beginning to cup—instead of laying flat. I'm now working on a second petal motif (another set of 6) and between the petals, ribbing and lace fagoting. 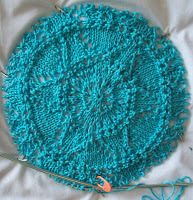 Once the petal motif is finished, the fagoting lace will continue. No more rounds of beading till a simple set at the base of the crown, before I start the band. 2-- it is being worked at a larger gauge. So it should fit a lot better! I didn't get much done (knitting wise) yesterday—I spent an hour (the longest I have spent in YEARS) at the DMV--I forgot to mail my registration renewal—and I am way to middle class to let things like registration or insurance lapse—I might end up wasting an hour on the last day of the month—but it's gets done! I think I am going to get more than the expected amount of knitting done pool side—it's day 3 of the season, and already there is drama. The petty spats of last year started up on day 1 (I missed day 1 – and on day 2 I missed the pettiness, but I heard all about both days on day 3!) It's picking up as if there were just 12 hours (not 9 months!) between Labor Day (September) and Memorial Day (May). It takes 2—and truthfully—I just don't care! I get in the pool and do my water aerobics, and when someone makes a snide remark? I become hard of hearing! Besides, my 'problem' is the I “hang out” with the “real trouble makers”--Well that's what the gossips tell me. It is called 'chicken pecking order' and sadly, we humans haven't risen above it. I like how this one is turning out too! Love the hat - and love even more that you are hanging out with the real troublemakers:) Kewl!